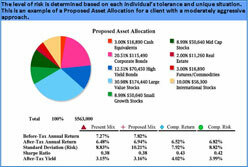 Asset Allocation Analysis: We analyze your current investments and determine if you are in the optimal asset class with the best investments for your unique financial situation. The goal is to determine if you are being adequately compensated with potential returns for the risk you are undertaking. 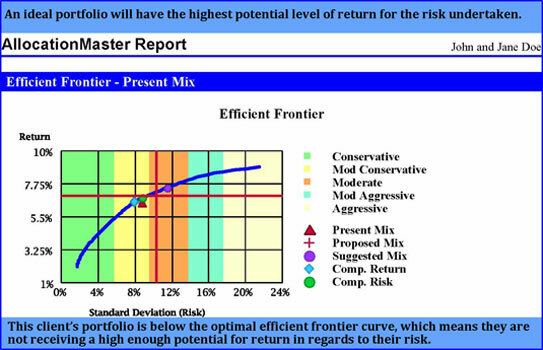 Determine if your current portfolio is located on the efficient frontier, which is a curve that shows you the level of potential return you should receive per level of risk. We compose an optimal proposed portfolio that will place you on the efficient frontier so that you will receive the highest level of potential return possible given the level of risk undertaken. We show you the exact adjustments needed to be made to change your portfolio from its current Asset Allocation to the proposed Asset Allocation. We provide you with an action plan of exactly what to do to efficiently position your portfolio in the optimal asset class.